Have you heard about the Clever Little Monkey Loyalty Rewards program yet? If not, you may be wondering what it’s all about, what our loyalty rewards offer and why you use them. In a nutshell, this program gives you points on every order placed at our online shop. It is a really easy way to save on your next purchase, and getting started takes no time at all. Participation in our Loyalty Rewards program is automatic, but what does this actually mean to you? And, more to the point, what can you get from our Loyalty Rewards program? Keep reading to find out. How Do Clever Little Monkey Loyalty Rewards Work? What is the deal with loyalty points then? From Woolworths to Pick ‘n Pay, Edgars, Clicks and many other retailers around the world, loyalty points are a simple way to earn points on items that you purchase. This concept offers a win-win for everyone. For you, as a customer, it is the easiest way to earn points without doing much else besides buying the products you would normally buy. For stores, it is an easy way to reward customers for their loyalty. How can you earn Loyalty Rewards points? Earn 2 points on every R1 you spend. 2000 points gives you R20.00 off your next purchase. These points go towards credit on future purchases. Points are added to your account after successful checkout. If any changes to your order are made, your reward points will reflect accordingly. The next time you are at checkout your point will be available to redeem against your purchase. Here’s how to see how many points you will earn on your purchase. On our Adventure L-Bunk, for example, you will earn 15380 points. Look below the product name and you will see how many points you will earn. But how much is that, actually? 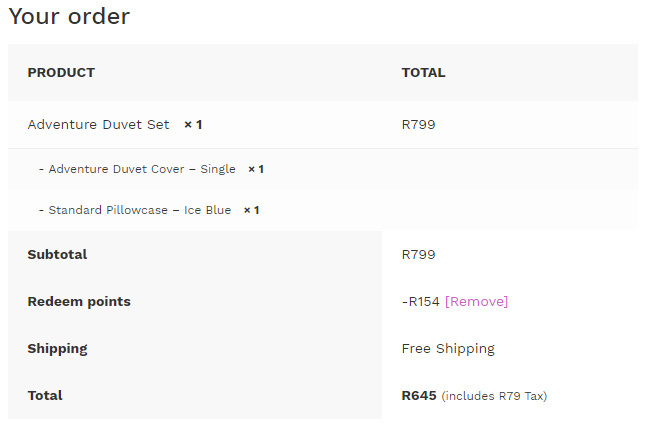 It’s easy, just put an “R” in front and a “full stop” two spaces from the right and its R153.80 That means you have R153.80 to spend on your next order, rounded up to R154! You don’t need to join, you earn points automatically when you order? So if you have already shopped with us then you already have points on your account. Find out how many points you have by viewing your account page once logged in. If you bought the bunk above you will see that there are 15380 (R154) worth of points from your bunk purchase. But how do I use them? Using your points is so easy. The next time you view your cart at checkout you will see that these points are available to use. Just click the “Apply Discount” button. And your points discount will be applied to your cart. It’s simple – you can earn points simply by shopping at Clever Little Monkey. This means that you won’t have to do anything but enjoy our amazing products to earn points. All you need to do to get started is start shopping. You’ll also get a bunch of other specials and deals as well, from member-only discounts to annual sales, featured products and plenty more besides. New members will get R100 off their first purchase when joining our family. Welcome to the Clever Little Monkey store! Hi – how long do the loyalty points last for? do they expire? Hello Lara, they don’t expire.